Congratulations to Raiders Nicole and Chris who both completed and uploaded the challenge recipe for the past month and earned a whopping 500 XP each for their efforts. But now it’s time for a new challenge, are you up for it? Wanna know what it is? I’ll just bet you do! Between today, April 25, 2013, and May 23, 2013, the Recipe Challenge of choice is our awesome Veggie Nachos (page 53)! 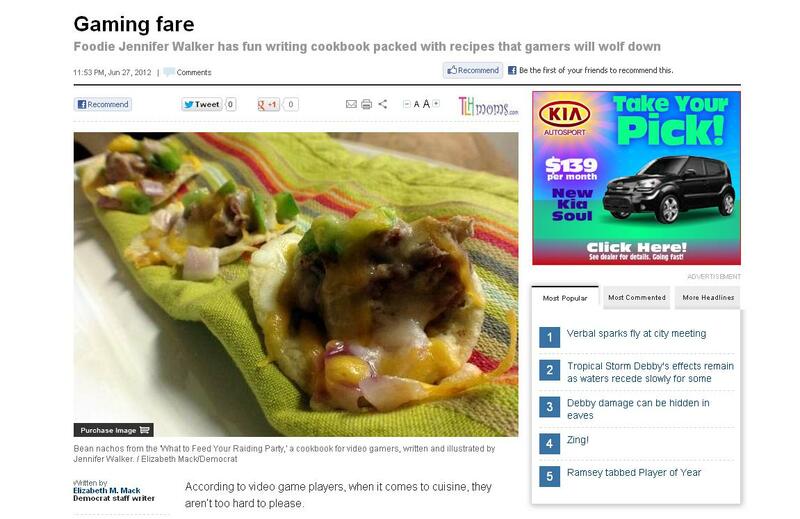 picture from when the nachos and I were in the local paper! Now, this is a simple recipe, but since Cinco de Mayo is coming up and people are going to be hosting graduation parties and end of school year get-togethers, I thought an appetizer that was truly tasty and super quick was totally in order. I love these nachos because each nacho gets a little bit of all the toppings so you’re not left with the lonely, naked chips at the bottom of the platter like you get when you just pile everything on together, plus they look a lot nicer than the mess those others usually end up as. What’s your incentive for making these over the next 4 weeks? How does double XP sound?! Yes, I know, we just did a double xp challenge but since we actually had folks participate I think we’ll stick with it this month, too, and see how it goes. And if that’s not quite enough of a bonus, how about I make you this offer, too? (But wait… there’s more!) These nachos use refried beans, rights? While you can certainly go out and buy them canned, we also have a very good recipe for them in What to Feed Your Raiding Party. So here’s the deal: IF you make BOTH the Veggie Nachos AND the Refried Beans from the recipes in the book (pictures of each, uploaded to their respective forum threads) I will also give you double the XP for the refried beans. 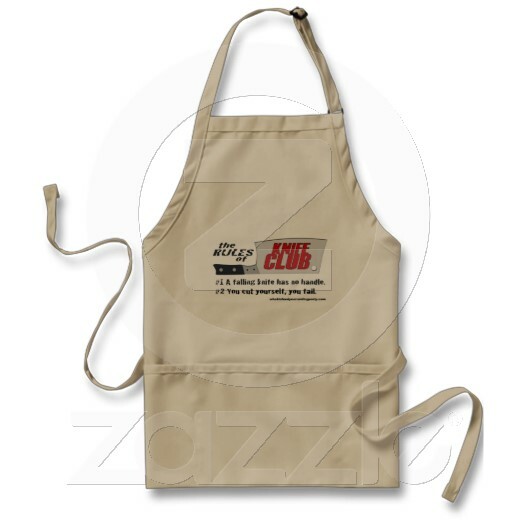 Make the nachos and the refried beans: 850 XP total! Remember, pictures or it didn’t happen, and that goes for both recipes! You gonna go for it? You’ve got nothing to lose! A lot of times people at conventions ask what they get for earning XP points, and I was kind of surprised at this since XP in any setting is pretty much intangible, it’s a measure of how far you’ve come, right? Nonetheless, it was never my intention to have the XP merely be for bragging rights/personal edification. It has always been the plan to include some more tangible rewards at certain levels and I think now’s a good time to announce the first one! Upon reaching Level 5 (which is 4000 XP, Junior Cook) you will earn an achievement badge that you can download and display wherever you so choose. I haven’t got it ready to show, yet, but I’ll be sure to share when it get’s done. This badge will be personalized with your user name and achievement date, too, just to make it a little less generic, right? It would also be a safe bet that enhancements to the badge would be added at 10th, 15th, and 20th level, kind of in the way medieval heraldry was augmented with elevated status. Now, that’s all well and good, but what about a little more? 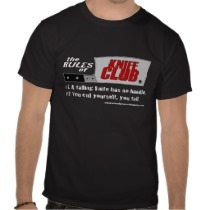 I’m feeling kind of generous, I guess, since my own birthday is less than a week away, but I’ve also decided to award the FIRST person to reach Level 5 Junior Cook status their choice of a T-Shirt or Apron from our Zazzle store, featuring our Knife Club design. I’m all about the incentive, folks, because unlike some people who just want your money, I really do care that people are out there using the book and cooking for themselves, their families, and/or their friends. I’m on a mission, here, folks… a tasty mission! Which leads me to our final tidbit of the day: North Florida Comic Con is this Sunday, April 28, in Jacksonville, Florida. I will be there and I’m looking forward to seeing some familiar faces, handing out more of our yummy samples, and hopefully putting books into more people’s hands. As I mentioned above, my birthday is next week and I would just be tickled pink if we sold even half as many as we did at ALT*Con 2 weeks ago. It’s the battle of the 1-day cons, I’m telling you! Of course, if you’re not in the Jacksonville area but still want a book, they are always available on our Store page. Might I suggest this as a fun and useful gift for the impending graduates out there (high school and college, we’re getting to that time of year, after all) about to be out on their own? With the illustrated techniques and clearly written instructions, What to Feed Your Raiding Party really does make a great learning tool for the beginner cook! I’m still offering free gift wrap for web orders, too, and Artist Editions are only $10 more. Okay, enough from me. Get in the kitchen and cook something tasty. Remember, pics or it didn’t happen! Don’t forget to sign up for AltCon 2014. They’re offering special rates if you sign up before May 27th. Brian already has the map up and it is going to be huge!